Enrico’s Vespa is an exciting book for children and a collector’s piece for all parents.Painted by Piaggio Advertisement-Illustrator of the 50’s and 60’s. With 60 pages, in full colour. Size 30cm x 30cm. Hardcover – Extras including a board game and a cut-out sheet at the end of the book. 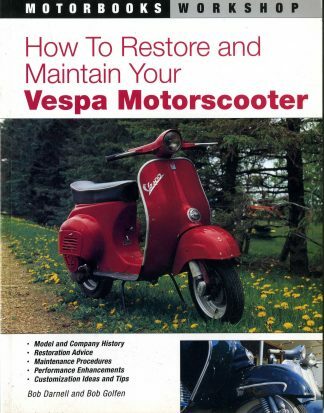 If Piaggio (the Vespa manufacturer) had published a children’s book back in the 50s, it would probably have looked like Enrico’s Vespa. Why? Because the prize-winning designer Elena Pongiglione has illustrated this book. 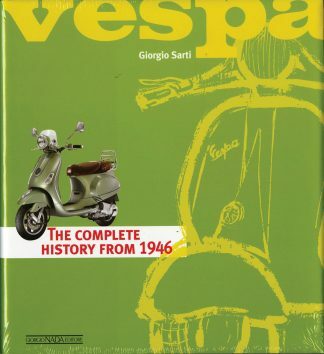 She designed most of the official Vespa artwork for Piaggio in the 50s and 60s. Today, deep into the Internet Age and 50 years after the great era of commercial art at Piaggio, this children’s book recaptures the spirit of the legendary Italian scooters. 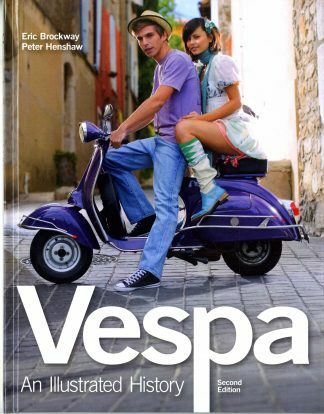 On his father’s Vespa, Enrico sets out on a fantastic tour through Europe. He is joined by his sister Elena, the teddy bear Yo Yo, the cat Minou and the dog Wow Wow. 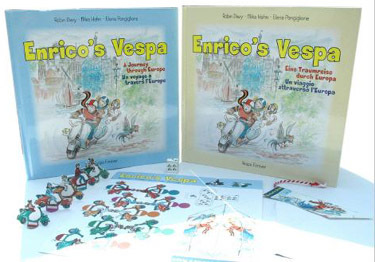 Enrico’s Vespa is an exciting book for children and a collector’s piece for all parents. This book also includes a board game and a cut-out sheet for the whole family featuring Enrico and his friends.